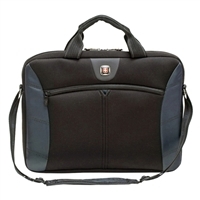 It's easy to carry your laptop with this 17.3" Slim Case that has soft-grip handles and a tear-resistant shoulder strap. Plus it has a trolley strap that easily mounts the bag onto a rolling suitcase. 18" x 2" x 14"